It must be quite a challenge to represent the message of Easter in a painting. 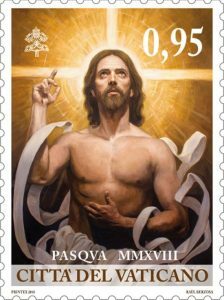 Spanish artist Raúl Berzosa, whose ‘Christ Resurrected’ is featured on the new Vatican City 95c postage stamp, tries it with physical beauty. The result, though interesting, fails to convince. Berzosa gives us a muscular, self-confident Christ who has just shaken himself free of his burial cloths. With his face towards us, the observer, Christ’s eyes, which are full of strength, look quickly towards heaven. Behind him, level with his head, and carefully worked geometrically, there is a cross of white light from which light spreads in energetic circles. The hands make symbolic shapes of a traditional kind which underline the heavenward glance of the eyes. Apart from the pierced right side, which Berzosa has reduced to a tiny scar, and what might be a miniscule wound on one wrist, there is nothing to remind the observer of the Crucifixion. This poster-boy Christ with luxuriant hair and well-trimmed beard steps towards us full of the lust for life. Which is as it should be, one might think. For what is the message of Easter, if not the gift of new life? The problem is that it is not new life. The focus of the painting seems to lie in the life in this world, as shared by us, the observer, and the artefact that is the painting, the life we know. Christ may be looking towards heaven, but his centre, and the centre of the painting, is here with us. Heaven and the Father are peripheral. The light of the cross comes not from there but from the power of Christ here and now. Risen, yes, but rampantly human. This is exactly as it should be, one might object. The new life in Christ made possible by the Resurrection happens here and now, and not just after one dies and goes to heaven. Modern theology, we are informed, is clear about this. And what is resurrected is our human life, is it not, even if it is transformed by Divine Grace. Otherwise, we would be transmogrified into something else, and would not be ourselves. Unfortunately, Berzosa’s ‘Christ Resurrected’ does not represent new life. No more than a good fitness programme would, or recovery from illness. If a transformation by Grace were recognizable in the painting, we might follow Christ’s eyes towards heaven, and find heaven looking back at us. Which is not the case. Wellness sessions in spa resorts have their place, as do the toned-up personalities brimful of self-confidence that emerge from them. But Easter must mean more.